Color fades, skin sags, wrinkles appear. Aging isn’t always pretty, and your smile is no exception. Luckily there are many things you can do to preserve and beautify your smile, one of the most important ways you interact with the world. Your smile says a lot about your personality and mood. It has the power to completely change someone’s day! Are you doing all you can to preserve it and keep it bright? We want you to have a happy, healthy smile, so today we’re sharing 6 quick and easy tips to improve your million dollar grin. Add a Brush. Most people brush in the morning and at night, but that means most of your day is spent walking around with food on and in your teeth. Keep a toothbrush and toothpaste at work or in your bag and add in a brushing session to your day for maximum clean. Bonus points for mouthwash! Floss First. Do you floss before or after brushing? 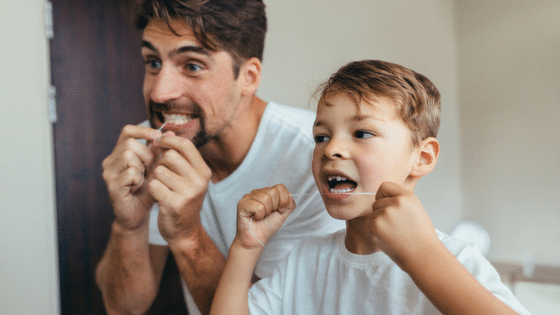 Dentists recommend that you floss FIRST, so that you are removing large food particles and then brushing away any excess, rather than flossing out food onto clean, brushed teeth. Floss picks are an easy way to make flossing fast and portable. Got Milk. Calcium is one of the easiest and most important ways to protect your smile. Drink milk, eat plenty of yogurt and cheese, or add a calcium chew to your daily diet and preserve your teeth for the long haul. Lip Care. Don’t forget about your lips! Care for your lips by staying hydrated, and using a chapstick or balm that includes sunscreen. Exfoliate your lips with a soft toothbrush if you experience dryness or flakiness – especially in winter months. Switch to White. Switching to a whitening toothpaste can be an easy way to brighten your smile without changing any of your regular routines. There are sensitive versions for those who experience pain with whitening strips – giving you a pain-free way to shine. Avoid Staining Substances. Tobacco, wine, and bright artificial candies or syrups can stain and also damage your teeth. Avoid these substances when you can, and rinse or brush thoroughly after consuming if you just can’t say no. Any investment in your smile is a good one, and you can trust us. We love to protect your smiles.